Automatic backup of any type of file. Easy-to-use, lightweight and totally reliable. The best free backup software for PC and Server. Iperius can automatically send your backups to the most known an reliable cloud storage services, to easily have online backups on Google Drive, OneDrive or Dropbox, with zip compression and AES 256 bit encryption. Iperius can create images of the whole disk, to allow you to automatically reinstall the system in a few clicks (bare metal restore). The disk image is made without any interruption or reboot (hot backup), and you can also restore it to dissimilar hardware. Iperius is a flexible and lightweight software to make multiple FTP transfers, to and from unlimited servers. You can make FTP backups in both Upload and Download directions, with zip compression, FTPS, AES encryption and bandwidth limitation. 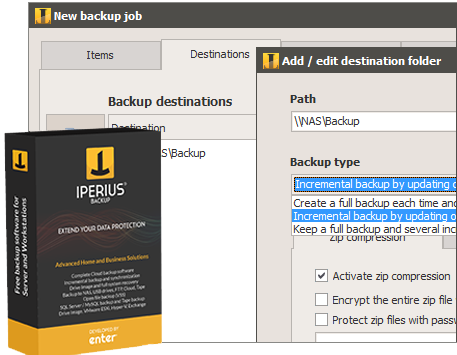 Iperius is a powerful and easy-to-use backup software for Oracle, MySQL, MariaDB, PostgreSQL and SQL Server. It can make automatic backups, it supports compression and encryption of backup files and copying of backup files to any destination. A simple, lightweight and powerful VMware ESXi backup software. Compatible with ESXi 4.x/5.x, hot backup without needing to turn off virtual machines, backup to network and tape, one low-cost license for unlimited servers and virtual machines. Iperius is an agile and powerful software to backup your data to any tape drive (LTO, DAT, etc.). Compression, password protection with AES encryption, automatic tape ejection, restore of individual files. Iperius can copy any file that is open or locked by other programs, thanks to its Volume Shadow Copy functions. This feature allows you to do hot backups of Outlook files (.pst), virtual machines, mail databases, etc. Iperius can copy files and folders to any mass storage device, like NAS, external USB drives, RDX devices, computers in the network. Zip 64 compression, AES encryption, synchronization, and possibility to keep incremental backups. Thanks to this useful service, a company or a reseller can monitor the backup of all the computers where Iperius is installed, through a user-friendly and centralized web console.